Rate this project Stanislav Hoferek has announced the release of Greenie Linux 8M, an Ubuntu-based desktop distribution optimised for Slovak and Czech-speaking users: "One month after the release of Ubuntu 10.10, a new release of Greenie has arrived. What is new? From this point on, Greenie Linux is primarily a DVD, as it is no longer possible to fit it onto a CD. Among the more interesting programs included in the release are Google Chromium, GIMP, Pidgin, VLC, Moovida, Pingus, WINE, OpenTTD and many other applications and games. 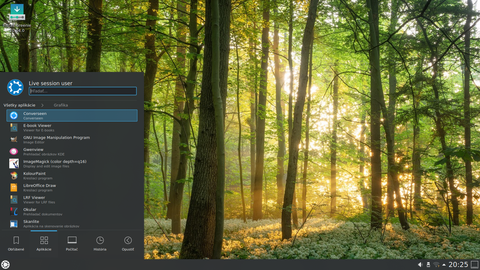 Greenie Center was re-built, new theme (Deepin) is used. Work from inside VirtualBox is much better, documentation was updated a bit and there is also better support for languages other than Slovak and Czech." Read the rest of the release announcement (mostly in Slovak, scroll to the bottom of the page for the brief English version). Download the live DVD image from here: greenie-8m.iso (998MB, MD5).